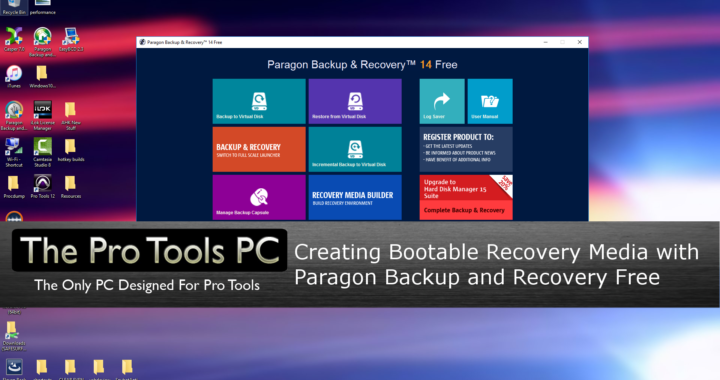 About an year and a half ago we created a couple popular videos on creating and restoring system images with Paragon Backup and Recovery Free. In this video we wanted to take it a step further and make a video on creating bootable recovery media with Paragon. The purpose of creating bootable recovery media is a safety net in case your system does not boot. It will give you the option to restore your system drive with a previously created image or to reset your Master Boot Record, assuming they are contained in the previously created image. This is never a good feeling to know you may have to use recovery media. It is the result of your computer not booting. There are countless reasons this could happen and none of them are obviously favorable! With this process you can take a previously created image, boot into the flash drive that runs a portable version of Paragon Backup and Recovery. From here you can restore your operating system drive or MBR back to a previous image. The downside of this process is that you will lose anything that is not backed up on your operating system drive. This is where services like Dropbox or One Drive are lifesavers! If I was to give readers any advice related to computers, the #1 statement would be: BACKUP - BACKUP - BACKUP! This is definitely a last resort situation, but its always good to have that option rather than no option! Sign up to our email list, Follow us on Social Media and leave us your thoughts and comments below. Get Izotope RX Elements for Free! Syncing 2 Pro Tools Systems via Midi Cable. Posted in Education, Free Support, System Maintenance, Tech Support, Tutorials and tagged Bootable, Recovery, Tutorial, Windows. Check your inbox or spam folder now to confirm your subscription, if you don't do this you wont get any emails from us.